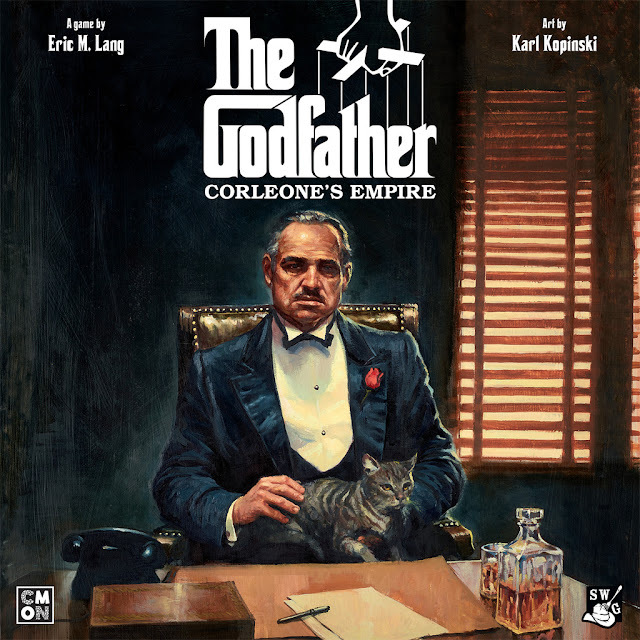 I have the pleasure of reviewing The Godfather: Corleone's Empire which, at the time of writing is Cool Mini or Not's latest 'hotness'. Unusually for a miniatures game, this title wasn't a Kickstarter and compared to CMON's other Kickstarter titles it shows. You're not getting hundreds of superfluous miniatures or any add-ons with this game. Instead, you get a game that has been designed to within an inch of its life and that is a good thing. I suppose we should expect nothing less than a fantastic design when Eric Lang is at the wheel and he has delivered in spades. The top-notch design extends beyond the game play and components to include the box and the vac trays. When I was opening the box it felt like unwrapping a new electronic device whose boxes are notoriously designed to exude luxury and functionality. Godfather's vac trays are among the best I've ever seen in a game. Usually, I will ditch the vac tray and create a custom insert to hold game components, not this time. Godfather's components also include a metal 'suitcase' for each player. I don't know why, but this addition tipped me over from curious to excited to play this game. You'll notice the base of the miniatures is either a square or circle; there are corresponding shapes on the game board which indicates the legal moves for each character. This aid helps to teach and play the game, there are other similar aids on the board to help the different setups at different player counts. 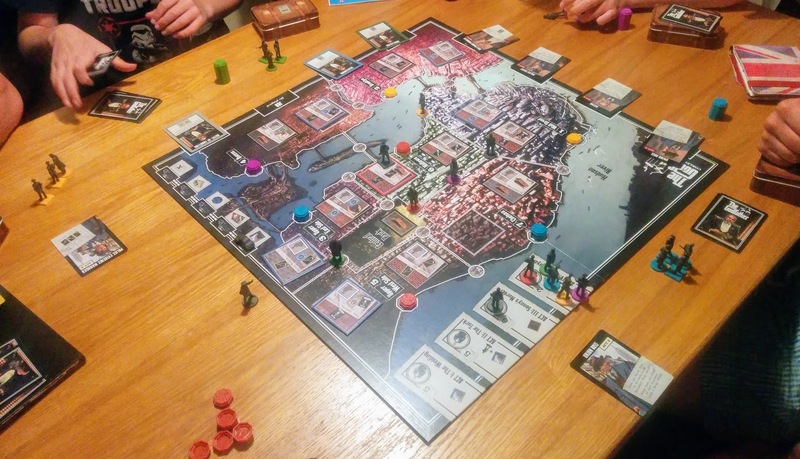 In the game, you control a family and thugs vying for supremacy of New York. The Godfather himself is a rather abstracted figure that only controls the game turns and some aspects of your hand management. Each family aside from the sculpts and names plays exactly the same. The miniatures themselves are, as you would expect from CMON, very well sculpted. But don't be disappointed by the lack of detail on them when compared to a typical fantasy figure; not many mobsters ran around New York bedecked in fur cloaks, leather pouches and scabbards! As you can see the box art is sumptuous and evocative of the early 20th-century gangster theme. This immersive art design extends to both the board and the rule book. The rule book is a work of art in more ways than one. Let's be clear here, this is a simple game; if not a gateway game then a very solid next-step game. The rules could have been crammed onto 4 sides of paper. However here you get a lavishly illustrated rule book which introduces the game and explains concepts so clearly, it could be used as an example in rule-book writing. On my first playthrough of the game, to make sure I knew the rules, I played with my 8-year-old son. For his benefit, I renamed the resource cards from narcotics, liquor, blood-money and weapons to a more palatable medicine, drink, money and guns. I think this may have sanitised my first play-through, a feeling which I haven't shaken on all subsequent plays. I would have liked the actions to feel a little more 'gangster' or brutal. One of the most enjoyable actions involves taking-out other players figures. When this happens you get to put the proverbial 'concrete shoes' on them and 'give them an offer they can't refuse' and literally toss their miniatures in the Hudson River. The other core actions are spending your resources to complete jobs or shaking down businesses. In order to maximise your turns, you need to manage your family. With no figures left you're not able to complete any of the ancillary actions open to you. This is a similar mechanic to managing your rage in Eric's previous Viking-themed game Blood Rage. There are four turns to every game with five phases per turn. It scales well from 2 to 5 players. At 2 and 3 players, however, the board did feel quite barren until the 4th turn where you receive your full complement of miniatures. With 5 players the final turn felt inordinately longer than the preceding ones. Ultimately this is a worker placement game, with a side of card-drafting in an attempt to control Manhattan and Brooklyn. Where you place your pieces doesn't induce the same level of angst in the other players as do the likes of Caylus or Agricola. It felt like there was nearly always an okay, if not a good option left to take. However, for its audience, I think this is a design feature; very few players will find themselves alienated or picked on at any stage. When I played the game with my slightly-more experienced group, they all agreed that it had become one of their favourite games and would look forward to playing it again. We rarely get the same games to the table but I think the Godfather will be a regular and welcome visitor to my gaming table now. This game feels a little light for my tastes but I still thoroughly enjoyed it and it was definitely a hit with my core gaming group. I would like to thank 365games for the copy of Godfather: Corleone's Empire they've provided for this review. RRP for this game is £79.99.